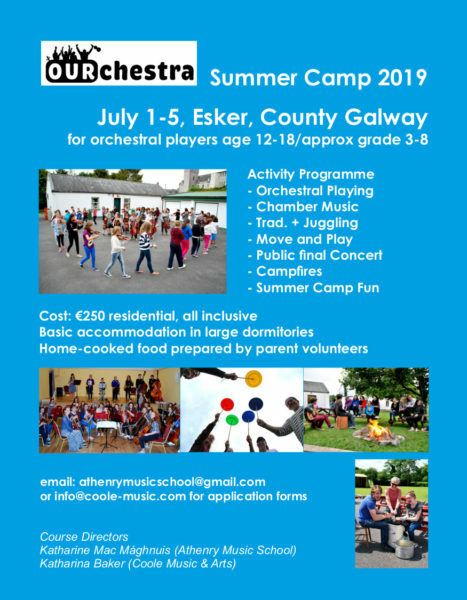 OURchestra Summer Camp 2019 will take place in Esker, County Galway from 1 – 5 July 2019. OURchestra Summer Camp is a fun, interactive week-long residential music camp based in Esker Youth Village, Galway, blending orchestral playing with chamber music, traditional and gipsy tunes, juggling and campfires. OURchestra is an orchestral programme for players aged 12 – 17 years of age of grade 3 – 8 standard. The course involves orchestral playing, chamber music, choir singing, improvisation, juggling, variety shows and will end in a final public concert. Contact ourchestra.esker@gmail.com for more information.